With so many combinations at your disposal, how can anyone narrow down to a manageable color palette? Is it possible that our experience and intuition might help us winnow down to the colors we need? This series of quest cards offer quick and tiny thinking strategies that, when completed, will have set you up with the beginnings of a color palette for your next project. Take one of the characters you created in Quest 9: Insta-Cast and create three color comps of the character, each representing: a) a positive color scheme, b) a neutral color scheme, and c) a negative color scheme. Share your results in a blog post and Twitter with the #liaquest11 tag. Like quest 9, these cards are meant to be done in order. 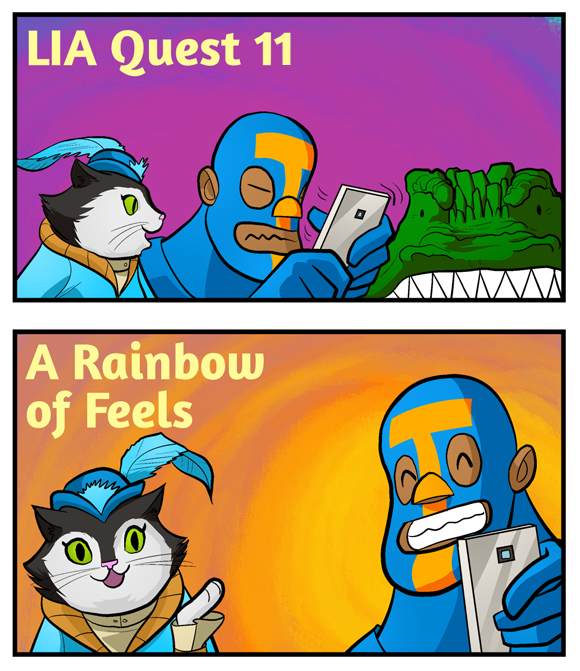 Tweet your quest card results and be sure to include the hashtag #liaquest11! Deadline to have your quest discussed on the show is March 26, 2014!